These are not related to the AUCSO annual awards but members many be interested to know about the OSPAs and nominate their staff for any outstanding achievements. The Purple Flag Scheme is an accreditation process similar to the Green Flag award for parks and the Blue Flag for beaches. It leads to Purple Flag status for town & city centres that meet or surpass the standards of excellence in managing the evening and night time economy (ENTE). 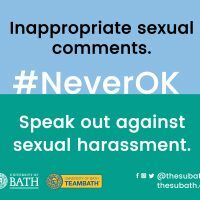 Sexual harassment is a current problem on campus, so our thanks to Brian Schofield at the University of Bath, who has shared his ‘Never OK’ campaign material with us.